Fancy improving your skills ahead of the District Archery and Shooting competition? Want to work towards your Master at Arms badge by attending regular training sessions for at least six sessions? Or perhaps just drop in for one or two sessions. 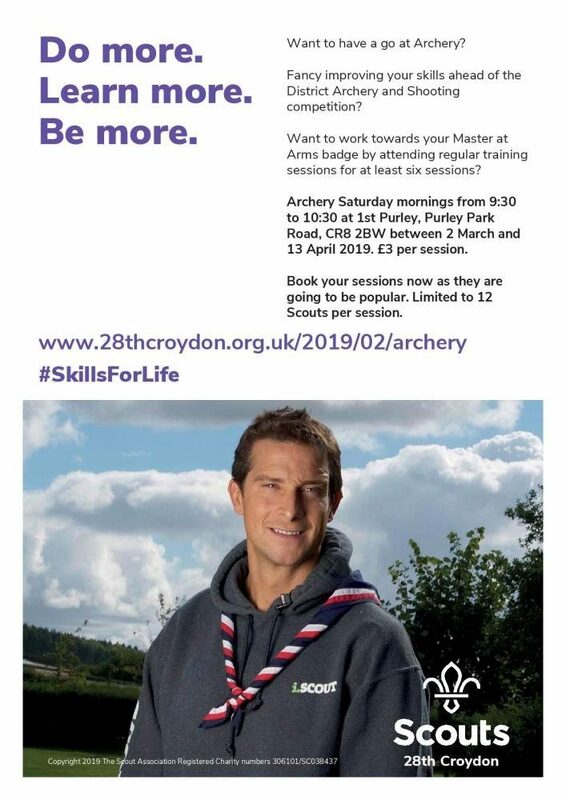 We will be doing archery on Saturday mornings from 9:30 to 10:30 at 1st Purley HQ, Purley Park Road, CR8 2BW. £3 per session. Book your sessions now as they are going to be popular. Limited to 12 Scouts per session. To book and pay for your place. You can book anywhere between one and all sessions. Want to work towards your Master at Arms badge by attending regular training sessions for at least six sessions? Archery Saturday mornings from 9:30 to 10:30 at 1st Purley, Purley Park Road, CR8 2BW. £3 per session.